When we think of the first Thanksgiving, we think of a picnic table covered with cornucopias of pumpkins, fruit, corn, and huge plates of turkey sitting closely nearby. We also think of Pilgrims and Indians standing around shaking hands and being friendly to one another. 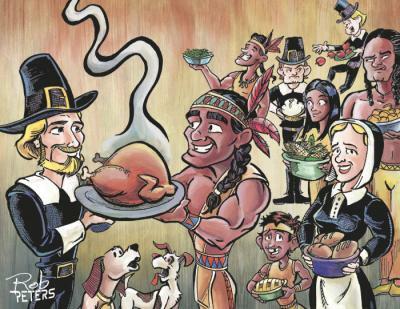 Did you know that the feast shared with the Wampanoag Indians (which we have come to know as Thanksgiving) and the first mention of Thanksgiving are really not the same event. During the first winter in 1621, 46 of the 102 pilgrims died. Thankfully, the following year resulted in a plentiful harvest. The pilgrims decided to celebrate with a feast that would include 90 natives who helped the pilgrims survive during that first winter. One of the most celebrated of those natives was a Wampanoag who the settlers called Squanto. He taught the pilgrims where to fish and hunt and where to plant New World crops like corn and squash. He also helped negotiate a treaty between the pilgrims and chief Massasoit. Dive into the history "books" and seek out interesting, odd, weird, and rare information that is not normally found in standard history books. You will gather three facts and the information surrounding them. Post your information onto the attached Google Docs file, with your name along side your entry. Create a 2 - 3 minute cartoon in GoAnimate describing the information and facts that you discovered. Don't be afraid to be creative and humorous. You are not being graded on your expertise as an animator. Have fun!